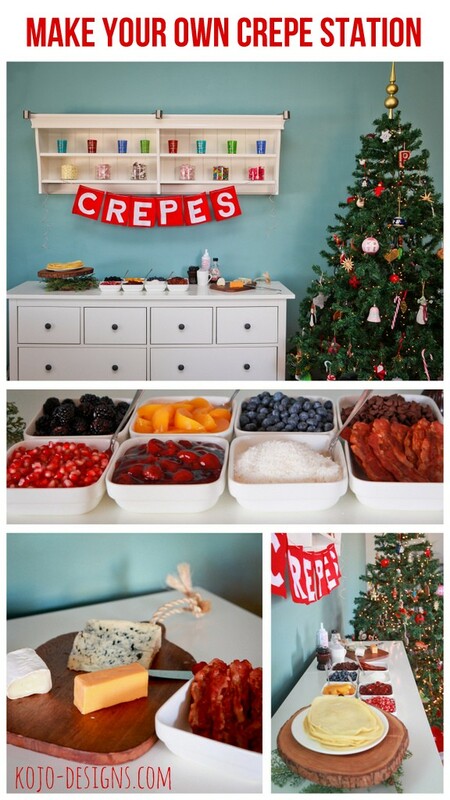 Are you guys as in love with holiday traditions as we are? It’s funny because there I am not a creature of habit at all (the term “free spirit” has been used to describe me my whole life)…but Christmas traditions are a whole different story. I LOVE them. 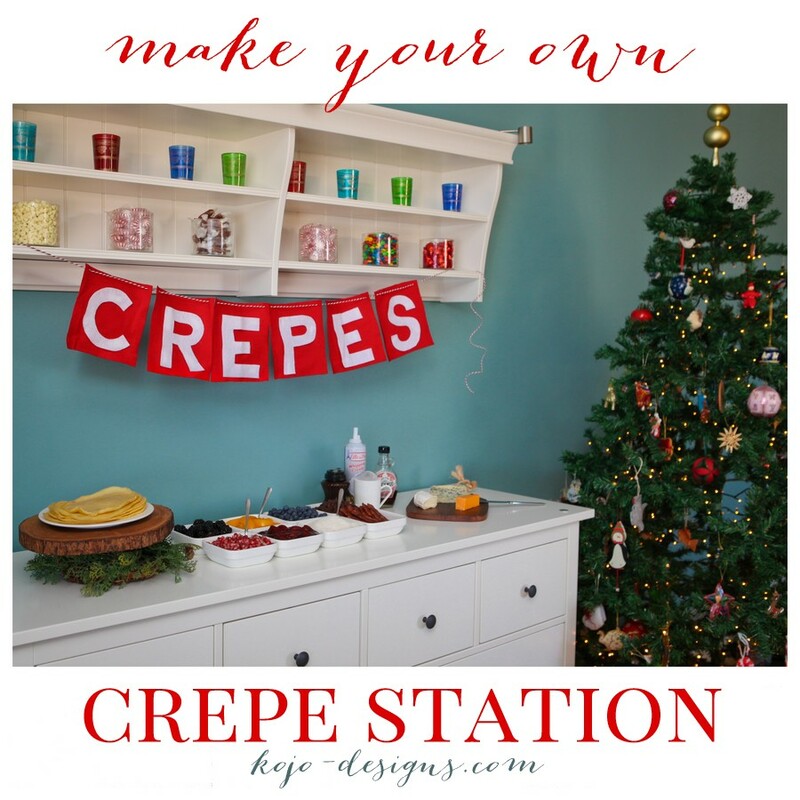 My husband and I decided that crepes on Christmas morning would be “our” tradition our first Christmas as newly weds. When we picked it, I just thought; “Why not? 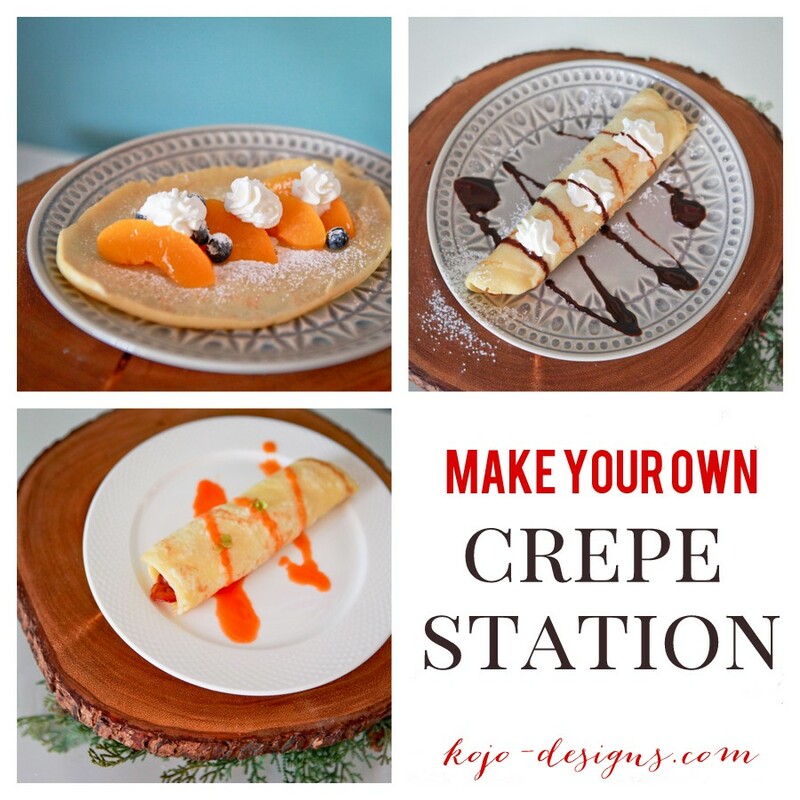 We love crepes.” I had no idea how much my kids would love it as well! It makes me giddy that they look forward to it and talk about what kinds they are going to make this year. That another thing I didn’t anticipate- the versatility of crepes really is genius. So many combinations! And even with a large group, every person can tailor it to their taste! I allot 2-3 per adult and 1-2 for kids (depending on appetites). You can make the crepes up to a week in advance and keep them in an airtight container in the fridge. Just pop them in the microwave in a covered container Christmas morning to heat them up. You can also do them Christmas morning (obviously). I have to admit, I kind of love having the smell of something baking wafting through the house. We go all out with toppings. It is Christmas morning, after all. My husband really appreciates that there is a savory option. My kids appreciate the whipped cream and powdered sugar. Get all the toppings chopped, washed and ready the night before, that way on Christmas morning all you have to do is set everything out! In a medium bowl combine the flour, sugar, baking powder and salt. In a large bowl, combine the milk, eggs, butter and vanilla. Slowly add the flour to the wet ingredients, stirring to combine. The batter should be thinner than pancake batter. Heat a skillet on low-medium heat and melt a knob of butter in the pan. Pour roughly 1/4 cup of batter directly into the middle of skillet and let it spread out to the edges of the pan. When the batter no longer looks wet (about 1 minute), flip the crepe and cook on the other side another 30 seconds- 1 minute. Repeat the process until there is no more batter (should make about 12 crepes). Serve warm with your desired filling! Merry Christmas Kirstin and Jordan! We miss you guys so much, but are so thankful that we get to see little snippets of your lives online. We miss you and love you so much! Give each other big hugs from us! MERRY CHRISTMAS Chrissy and crew! We think of you guys all the time and miss you like crazy! Love you! I’m so glad the package reached you….I wasn’t sure it would get there in time! Give those kiddos and Adam an extra squeeze for us today! Love you!